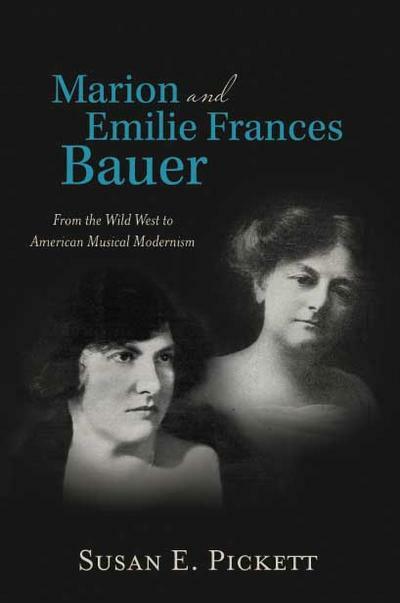 Susan Pickett’s Marion and Emilie Frances Bauer: From the Wild West to American Musical Modernism delivers exactly what the title suggests: adventures of two women in an exciting era of classical music. It follows them from their beginnings in Walla Walla, through European adventures, lives as musicians, critics, composers – and, for Marion – a career as a music teacher in New York City. The book is packed with letters, articles, music samples and reviews from and about the sisters, offering a clear idea of the classical atmosphere in the late 1800s to middle of the 20th century. Emilie Frances, the eldest of the seven Bauer children, spent much of her life reviewing recitals, new works and the classical music community. As a keen observer and commentator on the state of classical music, she criticized its failure to accept and promote female artists. Emilie Frances also took a dim view of the American musical community’s lack of support for works by its own members. Pickett includes interviews Emilie Frances conducted with Debussy and Puccini, and gives us a glimpse into Emilie’s broad and deep musical knowledge. Both Bauers’ views on the composers of the day – including Mahler, Debussy, Stravinsky and Beach – are passionate and eloquent. Though both sisters were published composers during their time, it is Marion’s music that is better remembered today and was more frequently performed in their day. Marion too had several European adventures, putting her in touch with another pair of sisters – Nadia and Lili Boulanger, who had an extraordinary impact in classical music internationally. Several of her works, such as Up the Ocklawaha for violin and piano (1912), received quite a bit of attention from reviewers and musicians alike. To round out the portrait of Marion, Pickett includes the reminiscences – both positive and negative – of several of her students. Emilie Frances and Marion Bauer lived during that fascinating time between the Romantic and Contemporary eras of classical music, so the book offers much in the way of historical material for anyone interested in both periods. Between the samples of their musical criticism, compositions and reviews, Susan Pickett provides a commentary and modern-day perspective on the Bauers, particularly on their strong feelings on American and women composers. Susan Pickett is a violinist and professor at Whitman College and has devoted much of her time to performing, uncovering and writing about female composers throughout the centuries.